Hi All! Long time no blog! I feel guilty for not posting more often, but I am just unable to get out like normal, growing this human in my belly and all ;) We are more than half way through the pregnancy now, found out last week that it is a boy, and could not be happier! I took this photo last year and can only imagine this is what Multnomah Falls must look like right about now, with our freezing temperatures lately. Just wanted to post something to say hi to everyone and let you know I am still around and missing the blogging and photography deeply! A boy! Wonderful news! Thanks for getting this photo out and sharing it with us. 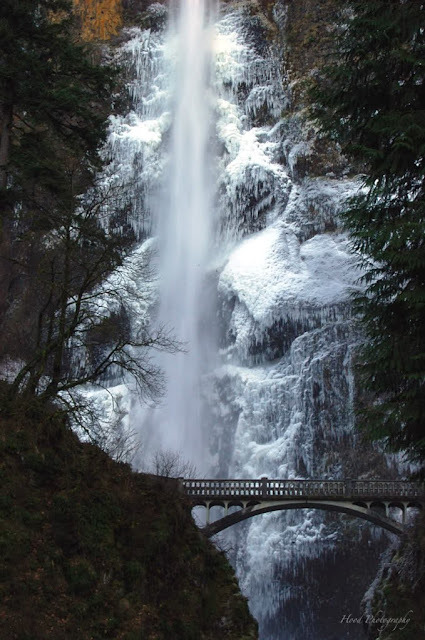 I am never brave enough to drive to Multnomah Falls this time of year, so I thoroughly enjoy such photos. Congratulations on having a boy!!! When are you due? I miss your updates but understand! This is a beautiful pic of Multnomah Falls and the icy rock face! This is a spectacular photo. Congratulations on the halfway point of your pregnancy. Take good care of yourself! Oh! how beautiful. Thanks for sharing this. I'm glad that your pregnancy is going well, I enjoyed being pregnant but that was long ago. Beautiful photo, I have never been to the Falls in the inclimate weather, but imagine that it's a sight to see! Must put it on my bucket list! Congrats on the halfway point of your pregnancy! Great Landscape photo! Love the contrast! Beautiful pic. My OW is up too. Following you on twitter as KB1. Great news, congrats! From now on, it will even get busier for you -but it's a happy reason! The falls are stunning! Hi meravigliosa foto... magica !